As I am spending at least one weekend a month in Lancashire I thought I would review the fabric shop offerings in the area. I started with Minerva, a company I only know through its online offer. It’s website is relatively sophisticated for the world of fabrics, and this company has invested heavily in making its products available to crafters and dressmakers all over the UK and beyond. They claim their warehouse is “award-winning” and maybe it is, but I didn’t get much of a sense of excitement as I drew up into the empty car park on Saturday afternoon. I entered the shop, which is a very long, airport hanger type building. It didn’t strike me as very welcoming and I actually felt somewhat intimidated by the scale of the place. Although this is a family run-business, and I think the family were present, I didn’t get a sense of fun or community that you get at most of my other fabric haunts. I often talk to other shoppers when choosing fabric, asking opinions and discussing our sewing plans. 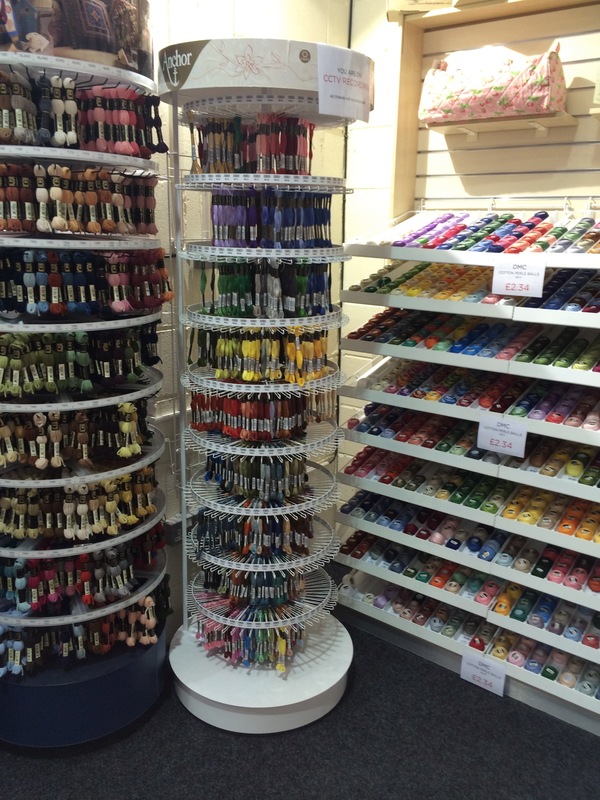 There is absolutely no end of choice of ribbons, buttons, elastic, and all types of haberdashery. It’s like they have the full range of everyone’s product. The big 4, Burda, unusual and independent brands of patterns – I had not seen By Hand London patterns in the flesh before. 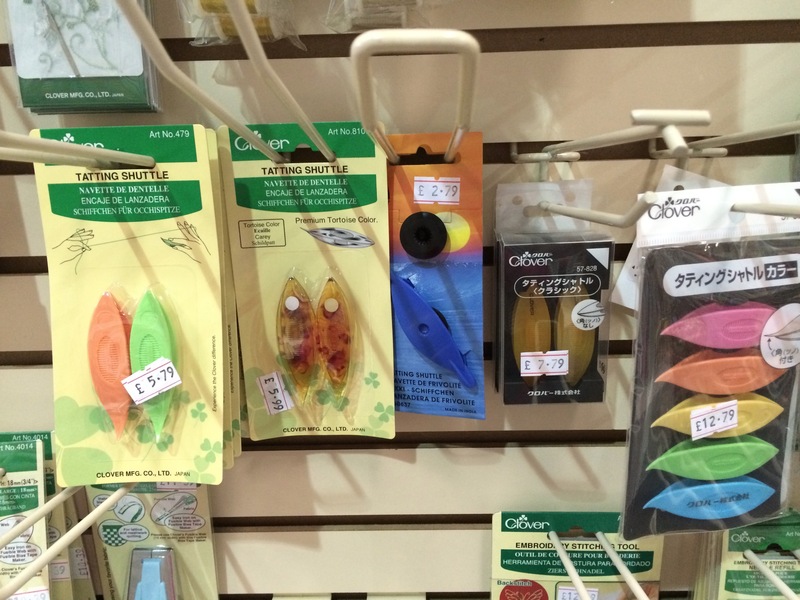 Even something as obscure (in the UK) as Nancy Zieman’s spool holders are stocked. You start to wonder what the market is like for tatting shuttles these days. They stock five different varieties including the “premium tortoise color” and the lovely set of colourful Japanese shuttles. They must be selling much of their stock on the internet as I would be surprised if there were more than five tatters in the whole of Darwen. As you can see it is a neat, clean and tidy shop. All the fabrics are well labelled with their content and providence eg “designer” (for fabric that looks like Liberty) or “Prada” for some shiny suit-weight fabric. They had a nice selection of linen with cotton in some great colours. But, as someone who generally finds it hard to leave a fabric shop empty-handed, the selection didn’t wow me. There are most types of fabrics in a range of colours but nothing to raise my pulse. And some tired looking, old-fashioned stuff. There were no bargains – even the most ordinary fabrics were £12 a meter or more. The whole atmosphere was decidedly dull. A dozen garments were made up – to inspire the shopper. 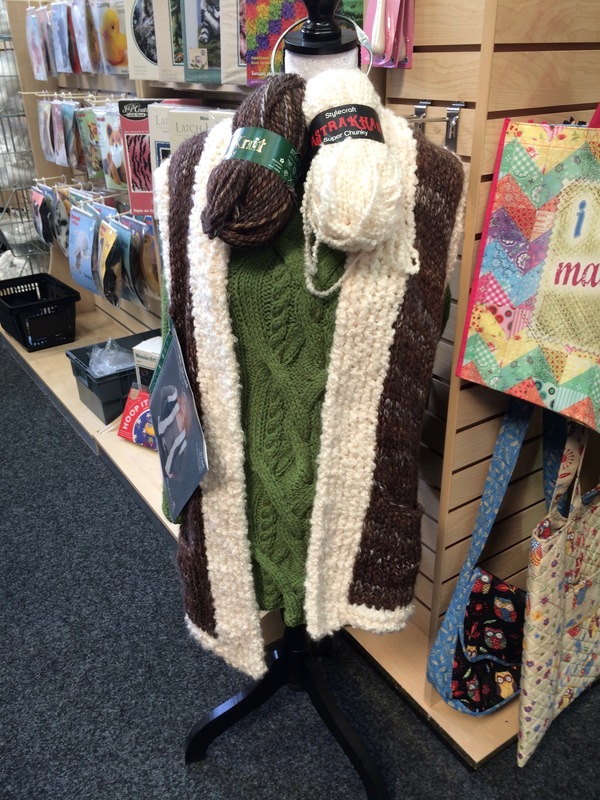 But really – would this make you want to create the green Aran and brown waistcoat at home? I did buy something. I actually wanted some basting thread. So I had a good look round. The only option they had was Gutterman – at £1.40 for a small reel. I asked if they had a large, cheap reel of the stuff, But no, that was it. In conclusion – a fairly good IT system with a fast turnaround allows an ordinary shop to shine on the web. In real life I was underwhelmed. Sorry. Sounds like a good place to buy from online if you want a specific something but don’t mind paying for it. 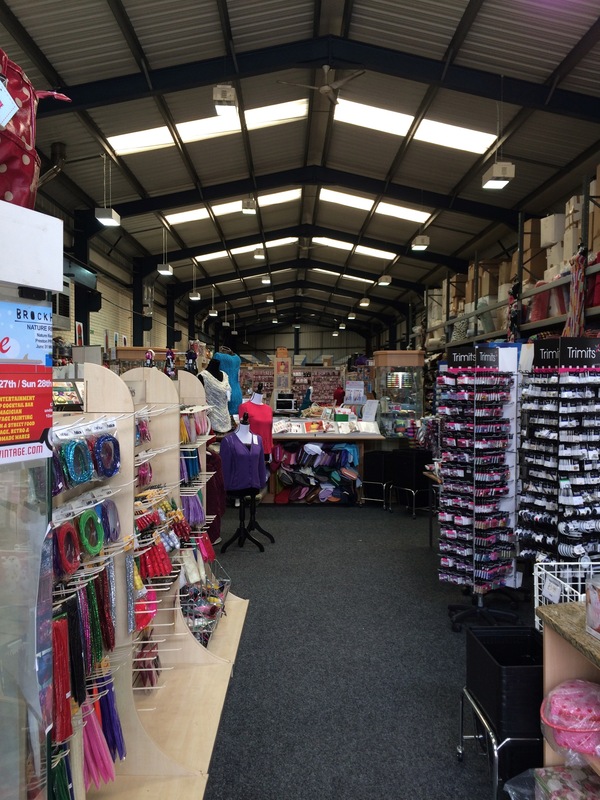 Jaycott’s sewing machines in Chester is in a similar hanger style unit and does a lot of their sales online, but is also a bit impersonal when you visit. I think some of the problem is with those warehouse units, practical but not very welcoming. I actually really don’t like their website much. I can’t face browsing through it for fabric despite the online assault of their sewing network. I can imagine being fairly underwhelmed myself, Kate. I love to go fabric shopping, but not in places that have that traditional fabric and haberdashery set-up. As much as I love John Lewis for everything else, their sewing department has absolutely no allure for me. I think for the same reasons. Hope you find some interesting fabric shops in Lancashire that you can share with us ! My personal pet peeve is Hobbycraft – so impersonal and soul-less . I am intrigued, Jay. What is the name of this East London shop please? Sheree its changed hands recently and I haven’t checked it out, but if you walk along commercial rd in the general direction of shadwell it is just past the ‘ideas store”. Of interest perhaps, on the other side of commercial rd there is a small side road with a sub post office and next to that is a store where you can buy various haberdashery things wholesale, but unless they have changed policy they do have a minimum spend (can’t recall if it was £30 or £50). It useful if you want to stock up on zips for example, which are sold in packs of ten, or basic coloured threads sold in boxes. The machine needles I did not find as good as branded, though much cheaper. Thanks Jay – nice to hear of somewhere new (to me). Will give it a try. If you’re making regular visits to the north west, you really should check out at least one branch of Abakhan. Yes – it is on the list. Thank you! I attended a blogger meet up at Minerva, to be fair they were very hospitable and very busy and it was buzzing. I wasn’t blown away by their fabrics but as I won a considerable amount of money vouchers, what I did buy didn’t cost much. They have a big Ebay presence and have, through their relationship with bloggers, gained a lot of publicity. I have ordered from them online but I was disappointed with the fabric quality and their customer service. Try if you can to get to Blackburn market, there’s a great guy there who has really nice fabric and who knows his stuff, and the market itself is renowned for great produce and is delightful. Aberkhan is hit and miss, depends where you go, Mostyn is a destination place and is isolated but it does have nicely laid out buildings around a courtyard, great prices too, I haven’t been to any others except for Chester which was v small and disappointing. I’m fortunate to be near a long established fabric shop, what the owner doesn’t know you could write on the back of a stamp, she often has some treasures and she is generous with advice and her cutting. Please can we have a list of UK/Ireland fabric haunts. Not that I need more fabric, but I do like a good time unearthing darling metreage! I have just come across your website and have enjoyed reading your blogs. However, I feel that I must comment on Minerva Crafts. I simply adore the shop and have been purchasing from them for quite a while. Annette one of the owners (who works in the shop full-time) and her staff have helped me immensely during my quest to learn new skills. I first decided to learn to knit and went along to buy the appropriate equipment not knowing what I required lol, the staff not only helped me in choosing the correct needles and yarn but proceed to teach me to knit 🙂 and offered their help anytime it was needed. As you can guess I frequented the store quite often during this time lol. Even though they were very busy at times, they still managed to find the time to help me.This also happened when I then decided to learn to Crochet. After seeing the vast selection of fabric and attending their open day (which was brilliant), I was inspired to learn to sew. I thought that surely the staff at Minerva would be sick of me by now, but no, the advice offered when I enquired about what sewing machine to buy was fantastic (even though they don’t sell them). I then went on to making 43 handbags to sell for charity. The staff at Minerva helped in not only the choice of fabrics, interfacing etc but advising me what the cheapest option was, which was great as it helped me raise a lot of money. They have a good selection of fabric in the shop, however, if you cannot find what you are looking for (as happened to me when I was making the handbags, I wanted a butterfly fabric but the ones in the shop were not quite right) there is the facility to look at their range on line in the shop, they also brought out a large selection of fabric with butterflies on from the warehouse which turned out to be perfect. I find the prices competitive with other online stores (I love shopping around for bargains) along with the added bonus I joined their craft club which costs me £20 per year but gives me extra discount of 10% off, and on special days 20% off. 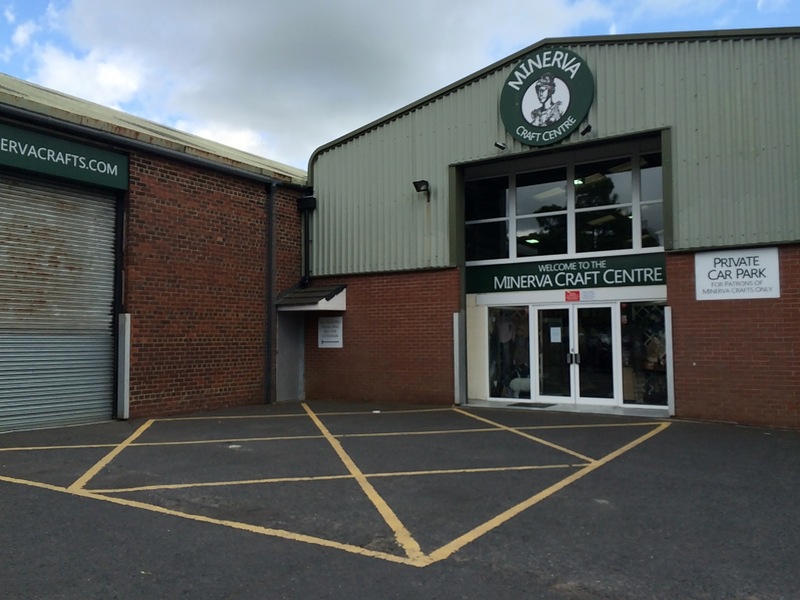 I am not affiliated to Minerva Crafts in any way, but wish to share my positive experiences of excellent customer service, I can quite happily spend hours looking at yarns and fabrics in this store lol. I’ve been…. Won’t be going again, I was definitely underwhelmed and after an online shopping experience with them I won’t be shopping with them in the future. Customer service polite but totally inflexible.